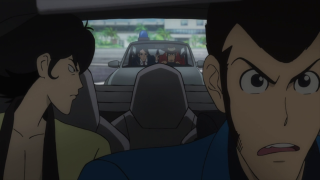 Continuing the thread from the first episode, this one sees Lupin and the gang deal with the fallout from upsetting the dark web peoples' honeycomb: a full web surveillance of Lupin that attracts law enforcement (and Zenigata particularly) to his every location. So most of this episode is about Lupin trying to figure out a way to intentionally evade his millions of new pursuers in much the same way any sudden celebrity accidentally does: become a dead meme. 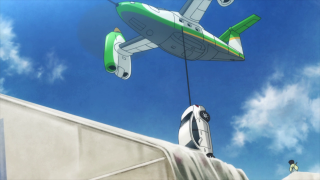 As Lupin is a clever fellow, his first, more direct approach to his situation is to get out of Dodge by way of using an electric car's fuel supply to hijack an electric-powered aircraft. Then he makes his way to Cameroon, which isn't an ICPO member nation, and set up shop by showing himself all over the internet, having himself social media accounts that display his every little action until he just plain gets old in the pursuer's mind and they move on. It would be bad for business if everybody was all over him all the time, after all. 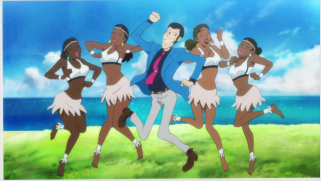 This is a really fun part of the episode, seeing Lupin have a lot of fun displaying his lifestyle like a celebrity, enjoying the company of strangers, even if just to get people off his back. I want to follow Lupin on Twitter. I doubt he'd follow back, though, I'm not very exciting. In the meanwhile, however, Ami believes her transaction with Lupin is complete. She's given him the backdoor to the Marco Polo service, he's spirited her away from her situation, there's no reason to stick around. But even before the assassins pop up, Lupin isn't so sure she should sever their relationship (amusingly, she mistakes this for sexual interest on his part). Whether this is Lupin's paternal instinct or his natural inclination to save young women is up to debate, but he's clearly somewhat protective of Ami, who's still really awkward out in the big world. 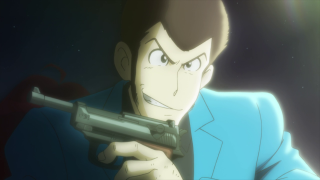 Though maybe this instinct of Lupin softens him a little more than I like, usually, we see first hand that he isn't so soft, as he scares the living daylights out of a random thug by nearly making him eat his Walther P-38. 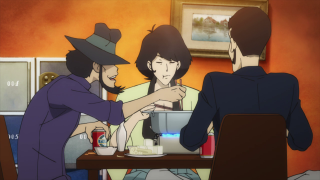 I see that Lupin, Jigen, and Goemon having to handle a cornucopia of killers will carry over to at least the end of the next episode, making this a rare three-parter. 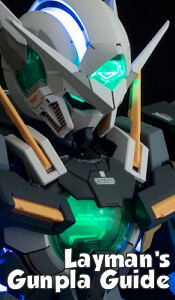 It is an interesting way to keep this plotline alive, by showing the next step the dark web masters would take after the Lupin Game became old hat to their hordes. Since they know where Lupin is, they may as well just send a bunch of hitmen (also available for digital currency) to that spot to finish him off. But they're dealing with the Lupin gang here, and they've handled assassins before (Goemon's even been one before). I feel bad for these poor fools. It should make for some interesting combat. 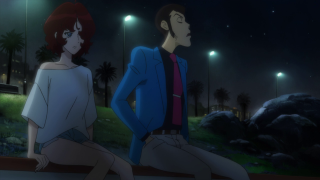 Once again, a great episode, Lupin shines when he's in the spotlight, and Ami is growing on me. I'm also wondering about Zenigata's new partner and how he'll factor into the rest of the show. I'm fully compelled to watch more.